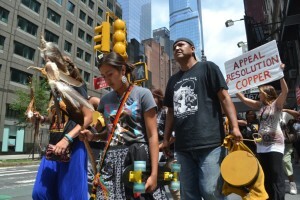 Rolling Stone writer Joseph Huff-Hannon a cross-country caravan called the Apache Stronghold, made up of dozens of activists and supporters of the Arizona San Carlos Apache tribe. The group is calling out a mining industry land grab rammed through Congress last December. Starting at Red Rocks earlier this month, and in venues across the country since, the Apache have been linking up with Neil Young on the road, sharing their stories and singing prayer songs to thousands of audience members.